Something I have learnt (and re-learnt) too many times to count is that one of the strange wonders of working for a startup company is that the most bizarre tasks can land on your lap seemingly with no warning. Expose HTTP/80 and HTTPS/443 endpoints on the public web and route incoming requests based upon URL to specific (and possibly many) private internal servers. Expose a separate and “special” TCP 443 endpoint (on public web) that isn’t really HTTPS at all but will be used for tunnelling of our TCP application protocol. We intend to use this when we acquire pilot programme customers that don’t want the “hassle” of modifying anything on their network firewalls/proxies. Yes, really. Even worse, it will inspect the source IP address and, from that, determine what customer it is and then route it to the appropriate private internal server and port number. Expose various other TCP ports on public web and map these (in as traditional “port map” style as possible) directly to one specific private internal server. Be easy to change the configuration and be scriptable, so we can tick off the “continuous deployment” check box. Configuration changes must never tamper with existing connections. Optional bonus, be source controllable. My first suggestion was that we would write some PowerShell scripts to access the Sonicwall firewall through SSH and control its firewall tables directly. This was the plan for several months in fact, whilst everything was getting put in place inside the data centre. I knew full well it wouldn’t be easy. First there was some political issues inside the company with regard to a developer (me) having access to a central firewall. Second, I knew that creation and testing of the scripts would be difficult and that the whole CLI on the Sonicwall would surely not be as good as a Cisco. I knew I could achieve #1 and #3 easily on a Sonicwall, like with any router really. But #2 was a little bit of an unknown as, frankly, I doubted if a Sonicwall could do it without jumping through a ton of usability hoops. #4 and #6 were the greatest unknown. I know you can export a Sonicwall’s configuration from the web interface. But it comes down as a binary file; which sort of made me doubt whether the CLI could do it properly as some form of text file. And of course if you can’t get the configuration as a text file then it’s not really going to be truly source controllable either, so that’s #6 out. Fortunately an alternative (and better!) solution presented itself in the form of HA-Proxy. I’ve been hearing more and more positive things about this over the past couple years: most notably from the Stack Exchange. And having recently finally shed my long-time slight phobia of Linux, I decided to have a go at setting it up this weekend on a virtual machine. The only downside was that as soon as you move some of your routing decisions away from your core firewall then you start to get a bit worrisome about server failure. So naturally we had to ensure that whatever we came up with involving HA-Proxy can be deployed as a clustered master-master or master-slave style solution. 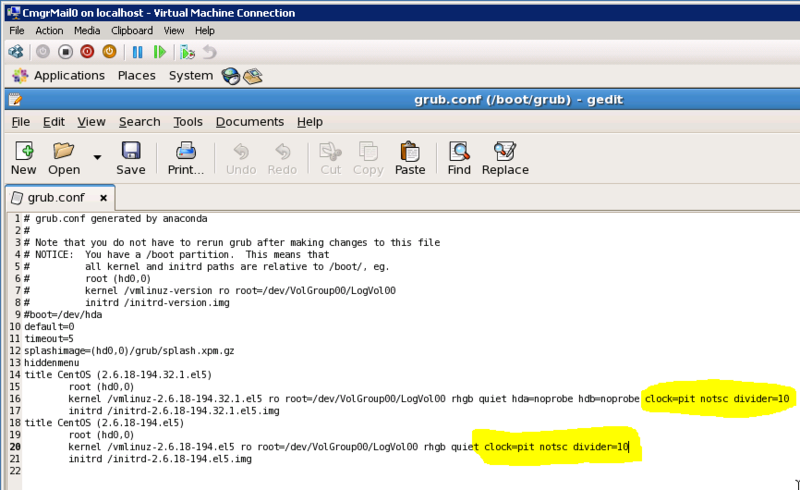 That would mean that if our VM host “A” had a failure then Mr Backup over there, “B”, could immediately take up the load. It seems that Stack Exchange chose to use the Linux-HA Heartbeat system for providing their master-slave cluster behaviour. In the end we opted for Keepalived instead. It is more or less the same thing except that it’s apparently more geared towards load balancers and proxies such as HA-Proxy. Whereas Heartbeat is designed more for situations where you only ever want one active server (i.e. master-slave(s)). Keepalived just seems more flexible in the event that we decide to switch to a master-master style cluster in the future. Here’s the basic /etc/haproxy/haproxy.conf that I came up with to meet requirements #1, #2 and #3. # Global settings for HA-Proxy. # Default settings for all sections, unless overridden. # Prevents zombie connections hanging around holding resources. # Host HA-Proxy's web stats on Port 81. # A "fake" HTTPS endpoint that is used for tunnelling some customers based on the source IP address. # Note: At no point is this a true TLS/SSL connection! # Note 2: This only works if the customer network allows TCP 443 outbound without passing through an internal proxy (... which most of ours do). # Bind to a different interface so as not to conflict with Public-HTTPS (above). # IIS 7.5 web servers. # IIS 7.5 web servers, that expose HTTPS/443. # Note: This is probably not the best way, but it works for now. Need to investigate using the stunnel solution. And here’s the /etc/keepalived/keepalived.conf file.
! this priority (below) should be higher on the master server, than on the slave.
! a bit of a pain as it makes Mercurial'ising this config more difficult - anyone know a solution? It is rather straight forward as far as other Keepalived configurations go. It is effectively no different to a Windows Server Network Load Balancing (NLB) deployment, with the right options to give the master-slave behaviour. Note the only reason I’ve specified two virtual IP addresses is because I need to use the TCP port 443 twice (for different purposes). These will be port mapped on the Sonicwall to different public IP addresses, of course. # Check whether remote repo contains new changesets. # Otherwise we have no work to do and can abort. echo "The HA-Proxy remote repo contains new changesets. Pulling changesets..."
# Update to the working directory to latest revision. echo "Updating HA-Proxy configuration to latest revision..."
# connections are dropped like a full restart would cause. echo "Reloading HA-Proxy with new configuration..."
echo "The HA-Proxy local repo is already up to date." I turned the whole /etc/haproxy/ directory into a Mercurial repository. The script above was also included in this directory (to gain free version control! ), called sync-haproxy-conf.sh. I cloned this repository onto our central Mercurial master server. It is then just a case of setting up a basic “* * * * * /etc/haproxy/sync-haproxy-conf.sh” cronjob so that the script above gets executed every minute (don’t worry it’s not exactly going to generate much load). This is very cool because we can use the slave HA-Proxy server as a sort of testing ground of sorts. We can modify the config on that server quite a lot and test against it (by connecting directly to it’s IP rather than the clustered/virtual IP provided by Keepalived). Then once we’ve got the config just right we can commit it to the Mercurial repository and then push the changeset(s) to the master server. Within 60 seconds then the other server (or servers, in your case possibly!) will then run the synchronisation script. One very neat thing about the newer versions of HA-Proxy (I deployed version 1.4.11) is that they have an /etc/init.d script that already includes everything you need for doing configuration file rebinds/reloads. This is great because what actually happens is that HA-Proxy will send a special signal to the old process so that it stops listening on the front-end sockets. Then it will attempt to start the new instance based upon the new configuration. If this fails it will send another signal to the “old”, but now resurrected process, that it can resume listening. Otherwise the old process will eventually exit once all its existing client connections have ended. This is brilliant because it meets and rather elegantly exceeds exceeds our expectations for requirement #5. The fact that our HA-Proxy’s will contain far more meticulous configuration details than even our Sonicwall, I think that this solution based upon Mercurial is simply brilliant. We have what is effectively a test and slave server all-in-one, and a hg revert or hg rollback command is of course only a click away. It’s still a work in progress but so far I’m very pleased with the progress with HA-Proxy. Before we switched to Mercurial in January 2011, we were a TFS shop. I hated TFS with some level of passion after using it for 4 years. It was slow, cranky and, well… merging was frequently a nightmare or sometimes actually impossible. But one neat thing that TFS did provide was the concept of “shelve-sets”. For those that don’t know: these are basically uncommitted (or unchecked-in) changes, effectively your work-in-progress. develop on multiple PCs, and be able to easily migrate unfinished code changes between those PCs. an immediate requirement came in that perhaps evaporated before the changes could be finished – but I suspected the requirement might spark up again a week or month later. perform zero-risk code reviews without getting stuck in all the mud of the wider TFS system (this point clearly doesn’t apply to Mercurial nor any of the popular DVCS). I’m not a big fan of the “Continuous Check-ins” movement that somebody seems to have started. It feels wrong to be committing stuff in unlogically grouped and unatomic units. And hell, the work-in-progress that you want to “shelve” may not even compile yet! Do I really want to be committing stuff that I might throw away later anyway? Maybe, if I was using Git which allows history rewriting far more easily. But Mercurial has a stricter policy around history and maintains a level of discipline to ensure an immutable history. There is already an extension for Mercurial that performs a type of shelving. But this was not suitable for me. It maintains the storage folder locally on the PC and doesn’t provide any obviously supported means of copying that between PCs. Mercurial provides (almost) everything you need out-of-the-box to be able to do a lightweight form of shelving, and you don’t even need to enable any extensions. What you need are the hg diff and hg import commands. Coupled with two shell scripts, and you will have a complete solution. The reason we use the extended diff format from Git is that, primarily, this supports binary files whereas a vanilla diff does not. And the reason for the --no-commit option on the importwip alias is to prevent the imported work-in-progress from being immediately committed to the repository. You definitely don’t want that! Note: There is no need for piping the file input on the importwip alias because the real command already requires that as an input argument. The guys in the Mercurial chat room are aware of this issue as we were all scratching our collective heads on it for an hour or two the other day. Here’s hoping for a bug fix soon! Alternatively, the whole issue could be bypassed if the hg diff command had an option such as “--out <filename>” to write the diff to a file directly. That would remove the dependency upon the shell for file output piping. Recently I deployed a CentOS 5.5 x64 guest on a Server 2008 R2 Hyper-V host for running a basic mail server. However I quickly noticed that the guest was losing time sync very rapidly, in the order of several positive minutes per hour. This was a surprise as I had already installed the Hyper-V Linux Integration components from Microsoft which I had assumed would just take care of everything for me. Not so, apparently. I might also add that Dovecot (an IMAP/POP3 server) kept crashing due to the periodic NTP sync being so far out that it resulted in the guest’s clock actually going BACK in time! This appears to be an acknowledged bug in Dovecot but it is understandable why they don’t feel a pressing need to fix it. Though I understand the 2.0 release has. For the record, I was running the 1.0.7.7.el5 release. Anyway, it turned out that the solution was very simple. This sets the clock source to use the Programmable Interrupt Timer (PIT). This is a fairly low level way for the kernel to track time and it works best with Hyper-V and Linux. This adjusts the PIT frequency resolution to be accurate to 10 milliseconds (which is perfectly sufficient for most applications). This isn’t strictly required but it will reduce some CPU load caused by the VM. If the VM will be running time sensitive calculations a lot (such as say a VoIP server or gaming server) then you probably shouldn’t include this option. Once you’ve done this, save the file and reboot the box. The time should now be synchronized precisely with the Hyper-V host! PS: I’ve not tested whether this solution will work without the Hyper-V Linux Integration Components installed, but I believe that it will. As it operates independently of Hyper-V’s clock synchronisation mechanism and relies purely on the virtualised Programmable Interrupt Timer that is exposed by Hyper-V. And the PIT clock source will remain unchanged whether you have the Linux Integration Components installed or not. PPS: The VMware knowledge base has a great article on this subject: http://kb.vmware.com/kb/1006427. Although take it with a slight pinch of salt (because the subject is Hyper-V) but it certainly gives several more options and ideas to try for different Linux distributions and 32-bit vs 64-bit etc environments.